The hobstar is a motif that is found in countless cut-glass patterns. To some people its presence unfailingly identifies a pattern that was made during the American brilliant period of cut glass, but this is not true. In spite of its popularity we have yet to determine the time and place of its origin. The British glass scholar R. J. Charleston probably came closest to this goal when he wrote that “the elaborate star patterns apparently [originated] in Bohemian Biedermeier glasses …” (Charleston 1984, p. 201). Bohemia = Czechoslovakia; Biedermeier style = c1820-c1840. The diagram on the left describes a typical hobstar. It has twelve points, but one can find examples ranging from five points (diagram on the right) up to sixty, an example of which is shown in Wiener and Lipkowitz (1975, p. 177). At each point on the 12-pt hobstar two miter cuts are made, one in each direction (clockwise and counter-clockwise). In this example each miter cut connects the fifth point from the point of origin, but the size of this interval is arbitrary. The resulting hobstar has an area, a hobnail, in its center. The miter cuts that surround this hobnail give it a “raised” appearance. The hobnail can be — and usually is — cut with another motif: for example, a single star, strawberry (fine) diamonds, a Brunswick star (see discussion below), or even another hobstar. The hobstar’s hobnail can also be subjected to the rose-cut style that once was used in the cutting of gemstones, particularly diamonds, but is now considered obsolete in that application. Because this lapidary cut-glass technique has also been used more generally on hobnails that are not part of hobstars, it is discussed elsewhere (rose-cut). When and where the term “hobstar” was first used is, like the motif itself, not known. The earliest use in American glass that the writer has found to date occurs in the design patent that was granted to Edward J. Koch on 20 May 1902 (patent no. 35,918). It is unusual to find a “technical” term like hobstar in a patent’s specification. Usually these texts were written by lawyers who avoided such term by using circumlocutions, sometimes quite elaborate ones. There is no mention of a law firm on Koch’s patent application, so perhaps he wrote the specification himself. The word “hobstar” is split over two lines of type, so it is not known whether it was spelled “hobstar” or “hob-star”. Dorothy Daniel, in her book published in 1950, preferred the latter spelling. The spelling of the word is of interest because it provdes an insight into the motif’s development. Originally, the motif was probably called, or at least thought of, as a hobnail-cut star. This probably became hobnail star and then hob star (two words) because hob is a shortened form of hobnail. This would have been followed, in time, by hob-star and finally hobstar. The single word emphasizes the motif’s uniqueness and is readily modified: 16-pt hobstar, multi-pointed hobstar, Middlesex hobstar, etc. Two points are worth noting in regard to the use — or rather the non-use — of the term “hobstar.” In 1889 Louis Dorflinger made specific reference to the hobstar that is cut on the foot of a wine glass, a drawing of which accompanies Hawkes’s patent application for his Brazilian pattern. Dorflinger called it a “patent star” (Spillman 1996, p. 93). Also, the multi-pointed hobstar that figures prominently in Hawkes’ Chrysanthemum pattern became so well known that it was sometimes called a “chrysanthemum star” when cut by other manufacturers. During these years the term “star” was usually used for what we now call a hobstar, in spite of the ambiguity. The reader is likely to notice that certain hobstars are sometimes referred to as “Middlesex hobstars.” This hobstar — diagrammed on the right — consists of eight points and is oriented so that the design resembles a Greek cross. (This type of star was a popular motif; it also appears on nineteenth century quilts.) The original Middlesex hobstar — as seen in design patent no. 17,072 by William C. Anderson — has a second 8-pt hobstar on its hobnail, as shown here. The name Middlesex comes from the name first given to this pattern which was cut by the Libbey Glass Company at the time when this firm was located in East Cambridge, MA and was known as the New England Glass Company. This might have been the first use of the “Middlesex hobstar” on American cut glass. When Dorothy Daniel published her book in 1950 she featured the pattern but at that time the pattern’s catalog name was unknown. It was likely Daniel, who first assigned the name “Middlesex” to the pattern, did so probably because this name appears in the patent’s specification as the home county of the designer (and Middlesex County was, as well, the home of the glass company itself). Because of the popularity of Daniel’s book with collectors of American cut glass, the name Middlesex was widely used. It was applied to other patterns by other companies if the patterns contained hobstars that were similar to those in the Libbey pattern. And, with the passage of time, the name also became associated with the 8-pt hobstar itself. This hobstar was not limited to patterns cut in this country, however, judging from a pair of British nineteenth century decanters that are shown in The Magazine Antiques, Sep 1997, p. 261. These decanters could pre-date Anderson’s patent. It is now known that Libbey’s catalog name for the “Middlesex” pattern is Victoria. This is not surprising in that the pattern was patented during the year of Queen Victoria’s Golden Jubilee, 1887, and both the designer and the head of the glass company had ties to England. Before the pattern’s true name was discovered, patterns cut by other companies that used this 8-pt hobstar motif were also often referred to as “Middlesex” or”Middlesex Variant.” Their correct names are now also known, with the result that today there is no Middlesex pattern. It is not likely that the term “Middlesex hobstar” will fade away, however, to be replaced by the more logical term “Victoria hobstar.” Middlesex hobstar is too well-established and cut-glass collectors are, by nature, traditionalists. 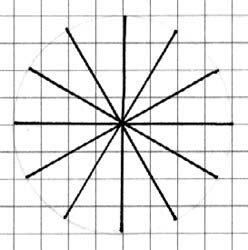 Before leaving Daniel’s work, it should be related that she contends that the cutters at the Libbey factory called the hobstar a “rosette” (Daniel 1950, p. 163). Today this term has come to mean different things to different people, and, therefore, it should be used, if at all, only informally and where its meaning is not ambiguous. The Victoria (formerly “Middlesex”) pattern cut on a rose bowl that has an unusually thick blank. Probably cut at the New England Glass Company in Cambridge, MA prior to its re-location to Toledo, OH where it became the Libbey Glass Company. An uncommon 7-pt hobstar in the base conforms to seven pattern segments on the bowl. D = 8″ (20.3 cm), H = 6.5″ (16.5 cm), wt = 7 lb (3.2 kg). Sold for $385 in 1985 (Photo: Bill Jarvis). One of the earliest examples in this country of the multi-pointed hobstar (with the number of points greater than the eight of the “Middlesex hobstar”) is shown in the illustration that accompanies the patented Parisian pattern, designed by John S. O’Connor who assigned the patent rights to his employer, C. Dorflinger & Sons. The patent, no. 16,676, was granted on 4 May 1886 for a term of fourteen years. Unlike other patents of the period, the designer gave full attention in his description to the multi-pointed hobstar in the base (center) of the design, but without using the word “hobstar.” The patent’s illustration shows a 24-pt hobstar with a multi-rayed single star on its hobnail. In some versions of the pattern this single star is replaced with a Brunswick star. Another early example of a multi-pointed hobstar is shown on a “round shallow nappy” that is cut in the Persian pattern by T. G. Hawkes & Co. The nappy has an impressive 32-pt hobstar in its center; its hobnail is rayed. Because this illustration is “taken from salesmen’s sample cards used in the early 1880s …,” cards that “are impossible to date exactly,” it is uncertain as to whether this example pre-dates O’Connor’s design or not (Spillman 1996, pp. 104, 176; fig. 8-27). Additional evidence is required. 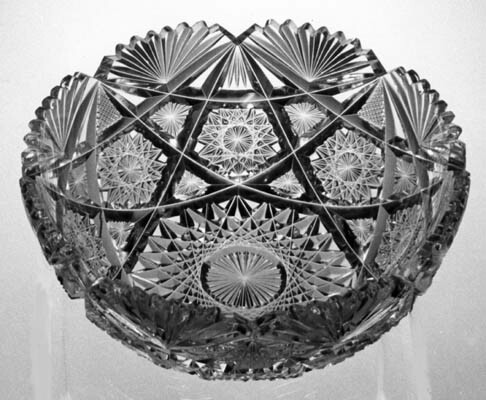 Another early Hawkes pattern, Cobweb, in production by 1885, also provides an example of an early use of the multi-pointed hobstar central to the pattern, that is, located in the bottom of a dish, bowl, or plate. Although the multi-pointed hobstar was used in the pattern itself — and not just in the base of a bowl — during the late 1880s, it was small and not given much emphasis. It took T. G. Hawkes’ patented Chrysanthemum pattern (1890) to change this. As an abstraction of the well-known flower with many petals, the pattern truly did celebrate the multi-pointed hobstar, liberating it forever from an exclusive use as a bottom-of-the-bowl decoration. Contrary to popular belief, the multi-pointed hobstar did not originate in this country. It was in general use in England, where it was called a “jewel star,” during the 1880s and 1890s, as reported by Wilkinson who comments that it is “not often seen on English glass as this is a typical German cutting” (Wilkinson 1968, p. 38). The English hobstar’s hobnail is usually left uncut; it is the star’s jewel. The earliest reference to a hobstar in an American catalog that has surfaced to date occurs in the Supplement to the New England Glass Works’s catalog of 1884 which is on file at the Rakow Research Library. The Supplement, with its price list, was probably printed in 1886. In this source are two examples of hobstars with rayed hobnails, centrally placed in the bottom of two nappies. Each is surrounded by the Russian pattern (items 34 and 36 on p. 13 of the Supplement). The resulting patterns are both described as “cut Russian & Glory Star.” Collectors seeking the earliest American reference to a hobstar would do well, therefore, to search for “glory stars” rather than “hobstars.” It is not known when the latter term was first used in print, but it was probably many years after 1886. Finally, it should be mentioned that several elaborations of the hobstar have been devised. For example, a fan can be placed between its points to produce a flashed hobstar (e.g., several patterns by Wilcox/Meriden); the pair of miter cuts from each point can be double-mitered, resulting in a double-mitered hobstar (e.g., the Toledo pattern by Libbey); two sets of mitered pairs, instead of one set, from each point can be cut, resulting in a double hobstar (e.g., the Windsor pattern by Dorflinger); and so on. Riddle: When is a hobstar not a hobstar? Answer: When it has lost its hob(nail). This may seem obvious, but many writers (including this one!) have ignored this fact and consequently have incorrectly labelled hobnail-less stars “hobstars.” How this misunderstanding arose will be detailed following a few comments concerning the cutting of this familiar motif for which the historical name Brunswick star is suggested. The Brunswick star is developed from the single star, such as the 12-pt example shown above on the left. Pairs of miter cuts are cut from each of the star’s points in both directions (clockwise and counter-clockwise). This procedure is identical to that described in the section on hobstars; in practice, however, the cutting of both the single star and the connecting miter cuts is quite shallow. The resulting star, above on the right, does look like a hobstar, but because it is based on the single star it is impossible for it to have a hobnail. A Brunswick star always has split points, but this is not unique. It is possible to “split the points” on a hobstar to produce a decorative effect. However, when this is done the hobnail remains intact. The single star gets its name from the obvious fact that there is but a single miter cut at each of the star’s points. 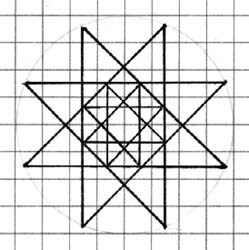 A hobstar has two miter cuts at each point, and so it could be called a “double star;” and because there are three miter cuts at each of the Brunswick star’s points, it, in turn, could be called a “triple star.” All these are possibilities, but only the term single star is ever used. When the Pearsons listed the various cut-glass motifs found in American cut glass in their several books, they called the Brunswick star a hobstar, ignoring the fact that it lacks a hobnail. As a result many collectors and dealers today also group the hobstar and the hobnail-less “hobstar” (i.e., the Brunswick star) together, under the name hobstar. But not everyone does this. Some writers have recognized that a hobstar without a hobnail must be something other than a hobstar. Accordingly, terms such as “flat star” and “zigzag star” have come into use. The writer believes that there is no need for these new terms because one already exists — the Brunswick star, and it has history on its side. The Brunswick-star motif is an old one. Hughes (1956, p. 195) shows a fine example, a 16-pt Brunswick star on a Scottish rummer with an estimated date of c1820. The motif does not seem to have been in common use during the nineteenth century in Britain, however, judging from the paucity of examples found today, although British authors often mention it (note 1). It is not known when and where the motif was first used; its name suggests a German origin. The Brunswick star is often dismissed as a minor, less-than-desirable motif. 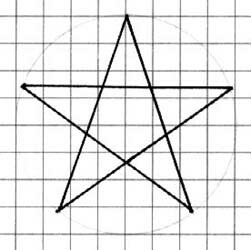 This is unfortunate because the star is an unqiue motif, and it can play an important role in cut-glass patterns. Collectors are usually surprised when they realize that a major pattern, such as Hawkes Panel, uses Brunswick stars rather than hobstars. Salad bowl cut in the Sultana pattern by the J. D. Bergen Company, c1893, on shape no. 102. The pattern includes a chain of 16-pt Brunswick stars surrounding a basal 24-pt hobstar that has a 32-pt single star on its large hobnail. Single stars, strawberry (fine) diamonds, interior fans, and fan scallops complete the pattern. D = 8″ (20.3 cm), H = 3.25″ (8.2 cm), wt = 3.25 lb (1.5 kg). Sold for $150 in 1985. 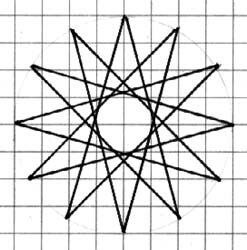 As in the case of the hobstar, a double form of the Brunswick star can be cut. It is constructed in the same manner as the double hobstar — that is, with two pairs of miter cuts eminating from each of the star’s points. A double Brunswick star is shown on the right. (This motif could also be called a “quintuple star,” but it never is!). 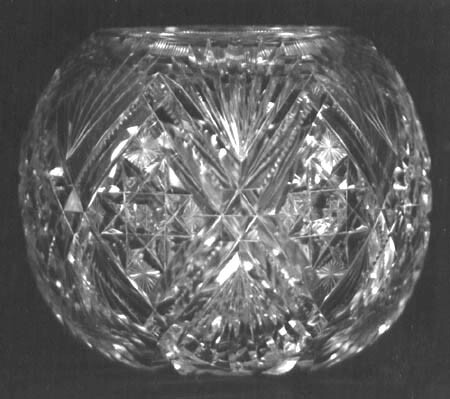 The elaborate double Brunswick star is not frequently encountered, but the Libbey Glass Company sometimes used it on a hobstar’s hobnail early in the twentieth century. One Libbey pattern that often, but not always, uses the double Brunswick star is the Somerset pattern. Libbey had a tradition of cutting the Brunswick star, both single and double versions, on the hobnails of hobstars with great precision, using a finely-dressed wheel. In fact, this characteristic can be used to help identify unsigned Libbey cut glass of this period. 1. British writers have traditionally tended to take a cavalier attitude toward the subject of cut glass, including cut-glass motifs. When they write about motifs their lack of care sometimes results in confusion. (This is illustrated by the example of “hob-nail cutting” that is described in Note 1 of the diamond motif file. 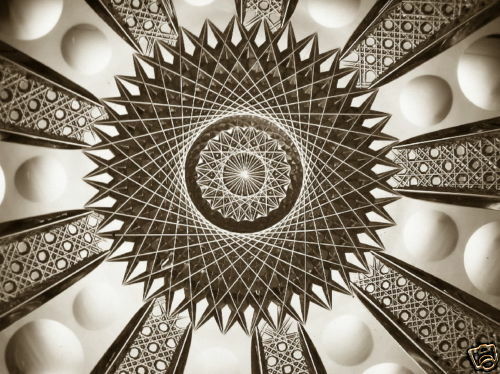 Elville has incorrectly equated the Brunswick and jewel star motifs in his book on Engliah and Irish cut glass (Elville 1953, p. 28), as well as in his dictionary, quoted here: “A favourite pattern (sic), for example, was the Brunswick star, often referred to in the trade as a Jewel.” He then illustrates a jewel star (i.e., hobstar), labelling it a “Brunswick star emblem or ‘jewel,'” and describing it as being “based on the radiating star (i.e., single star)”, which the jewel star clearly is not (Elville 1967, p. 70). Newman (1977) attempts to define both the Brunswick star and the jewel star, but he provides incomplete definitions that seem to be based on Elville’s work and which rely on the number of points encompassed by the miter cuts that form the stars’ points. This number is, of course, arbitrary and is not a defining factor. Newman does illustrate and correctly label a “jewel star” — just as he correctly illustrates and labels “hob-nail cutting” — but, as in that case, the illustration is separate from the definition and relates to a different entry in his dictionary. While it is clear that both Wilkinson (1968) and Charleston (1984), British authors, understood the basic difference between the Brunswick star and the jewel star, only Wilkinson provides an illustration, and that is for only one of the motifs — the jewel star. 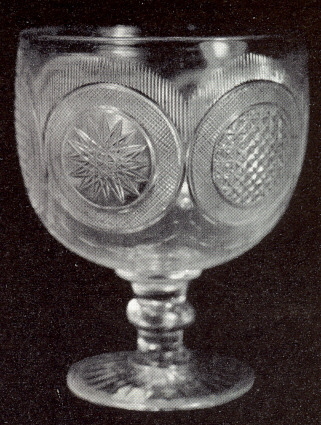 For an example of the Brunswick star on British glass one can consult Hughes (1956, p. 195). Related files: Hobstars and Brunswick Stars, Stars and catalogs. 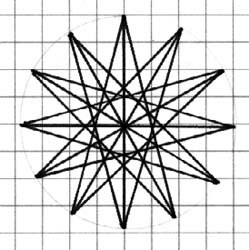 In our discussion of hobstars and Brunswick stars (the latter of which is sometimes incorrectly termed “flat stars”), we became aware that the two motifs are sometimes confused with each other and that the term Brunswick star has a different meaning when applied to, for example, crests and badges. 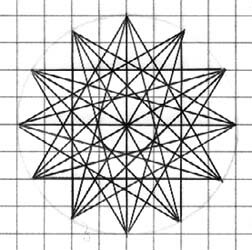 The Brunswick star is an emblem which in outline is an eight-pointed or sixteen-pointed star, but which is composed of many narrow rays. It is used in Britain to surround the Royal Cypher on various badges, such as that work on the caps and helmets of almost all police forces. The name “Brunswick” is the English name for the German feudal Land called “Braunschweig,” which was once ruled by Britain’s Hanoverian kings (George I to William IV). Hence the [name of] the emblem does not predate George I [ruled 1714 – 1727]. The points mentioned in this definition do not refer to the number of individual “narrow rays” but rather to the overall outline of the star. 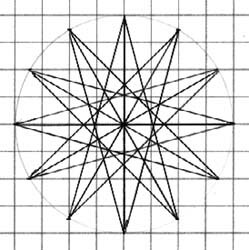 An example of this particular Brunswick star, which we can call the Old Brunswick star, is given in the motifs9.htm file in where the overall outline consists of eight points; there are fifty-six narrow rays. One can easily visualize this representation as being the source of the motif we now call the radiating, or radiant, star. It is not the Brunswick star that came into use in cut glass during the nineteenth century in both Britain and the United States (as well as in Continental Europe). Details concerning the birth of that Brunswick star are unknown at the present time; most likely they involve the very active cutting shops of Bohemia that were operating during the early part of the nineteenth century. Note that, although one sometimes finds the cross-cut diamond cut on the larger diamond’s diagonals, in the present case these cross-cuts are actually cut with continuous miter cuts. In other words, the motif on the panels that alternate with those that contain Brunswick stars is the quarter diamond motif as found on American cut glass, but at a considerably later date than c1820. To the left of the rummer the writer has sketched a Brunswick star with twelve points while the Hughes rummer has fourteen; otherwise the two motifs are identical. For comparison purposes he has added, to the right of the rummer, a regular 12-pt hobstar with a plain hobnail. This was, and is, usually referred to in Britain as a jewel star, a term that acknowledges the hobstar’s hobnail (which is the “jewel”). Unfortunately, some authors call the jewel star a Brunswick star, leading to obvious confusion. This mistake emphasizes the fact that motifs have not yet been completely standardized internationally. Nevertheless, along with the Brunswick star, the jewel star is usually regarded as having its origin in central Europe, probably during the mid-nineteenth century. In addition to British companies, the Baccarat company in France often used this type of hobstar during its own brilliant period (which coincided with the brilliant period in the United States). It makes little sense to call a Brunswick star a “flat star” yet it has become fashionable to do so. In fact, the flat star — which is illustrated in the motifs9.htm file in — is a distinct motif, one that was cut during the eighteenth century in England. Let us leave it there and then! Initially, the hobstar usually had a single star cut on its hobnail (informally referred to as rayed), but the motif soon was designed with hobstars large enough to comfortably accomodate Brunswick stars, thus bringing together these two motifs. Otherwise, the hobstar’s hobnail is usually found cut with the single star. The following example shows a 20-pt Brunswick star on the hobnail of a 36-pt hobstar, as part of the design of the Montrose pattern (c1895) by C. Dorflinger & Sons (Image: Internet). Although the United States can not claim to have “invented” the hobstar, it can — with considerable justification — claim to have elaborated it. American cutters sometimes flashed the hobstar with fans and added strawberry (fine) diamonds to the hobstar’s points, or else split them with single miters. And one can find other embellishments.